The biblical basis for the call to Christlikeness consists of three texts which we will do well to hold together: Romans 8:29, 2 Corinthians 3:18 and 1 John 3:2. The first is Romans 8:29: God has “predestined [His people] to be conformed to the image of his Son.” When Adam fell, he lost much, though not all, of the divine image in which he had been created. But God has restored it in Christ. Conformity to the image of God means to be like Jesus, and Christlikeness is the eternal predestinating purpose of God. The second text is 2 Corinthians 3:18: “We all, who with unveiled faces contemplate [or reflect] the Lord’s glory, are being transformed [or changed] into his image with ever-increasing glory, which comes from the Lord, who is the Spirit.” The perspective has changed—from the past to the present; from God’s eternal predestination to His present transformation of us by His Holy Spirit; from God’s eternal purpose to make us like Christ, to His historical work by His Spirit to transform us into the image of Christ. We don’t know in any detail what we shall be, but we do know that we will be like Christ. And there’s really no need for us to know any more. We are content with the glorious truth that we will be with Christ and like Christ. Here then are three perspectives (past, present and future) that are all pointing in the same direction: God’s eternal purpose (we have been predestined), God’s historical purpose (we are being changed, transformed by the Holy Spirit), and God’s final eschatological purpose (we will be like Him). These all combine toward the same end—Christlikeness, for Christlikeness is the purpose of God for the people of God. I want now to move on to illustrate this truth with a number of New Testament examples. But first, a general statement from 1 John 2:6: “Whoever claims to live in him must live as Jesus did.” If we claim to be Christian, we must be like Christ. We are to be like Christ in His service. Come with me to the upper room where He spent His last evening with His disciples. During supper He took off His outer garments, tied a towel around Him, poured water into a basin and washed His disciples’ feet. When He had finished, He resumed His place and said: “Now that I, your Lord and Teacher, have washed your feet, you also should wash one another’s feet. I have set you an example that you should do as I have done for you” (John 13:14-15). Just as Jesus performed what in His culture was the work of a slave, so we in our cultures must regard no task too menial or degrading to undertake. We are to be like Christ in His love. As Paul wrote: “Live a life of love, just as Christ loved us and gave himself up for us as a fragrant offering and sacrifice to God” (Ephesians 5:2, NIV). To “live a life of love” is a command that all our behavior should be characterized by love, but “gave himself” for us is a clear reference to the cross. So Paul is urging us to be like Christ in His death, to love with Calvary love. Do you see what is happening? Paul is urging us to be like the Christ of the incarnation, the Christ of the foot washing and the Christ of the cross. These events in the life of Christ indicate clearly what Christlikeness means in practice. We are to be like Christ in His patient endurance. In this next example we consider the teaching of Peter. Every chapter of Peter’s first letter contains an allusion to suffering for Christ, for the background of the letter is the beginnings of persecution. In chapter two, in particular, Peter urges Christian slaves—if punished unjustly—to bear it, not to repay evil for evil (1 Peter 2:18). We have been called to suffering because Christ also suffered, leaving us an example so that we may follow in His steps (1 Peter 2:21). This call to Christlikeness in suffering unjustly may well become increasingly relevant as persecution increases in many cultures today. We are to be like Christ in His mission. In prayer, Jesus said to His Father, “As you sent me into the world, I have sent them into the world” (John 17:18); and in commissioning, He said, “As the Father has sent me, I am sending you” (John 20:21). These words are immensely significant. This is not just the version of the Great Commission recorded in John’s Gospel, it is also an instruction that their mission in the world was to resemble Christ’s. In what respect? The key words are “sent into the world.” That is, as Christ had to enter our world, so we are to enter other people’s worlds. This entering into other people’s worlds is exactly what we mean by incarnational mission, and all authentic mission is incarnational. We are to be like Christ in His mission. Here then are perhaps the five main ways in which we are to be Christlike: we are to be like Christ in His incarnation, in His service, in His love, in His endurance and in His mission. We conclude now with three practical consequences of the basis and examples for Christlikeness that we have considered. Christlikeness and the mystery of suffering. Suffering is part of God’s process of making us like Christ. Whether it is a disappointment or a frustration, we need to try to see it in the light of Romans 8:28-29. According to Romans 8:28, God is always working for the good purpose of His people, and according to Romans 8:29, this good purpose is to make us like Christ. God’s purpose is to make us like Christ, and God’s way is to fill us with His Holy Spirit. We need your help now more than ever to spread the Good News of Jesus Christ. Click here to get involved. 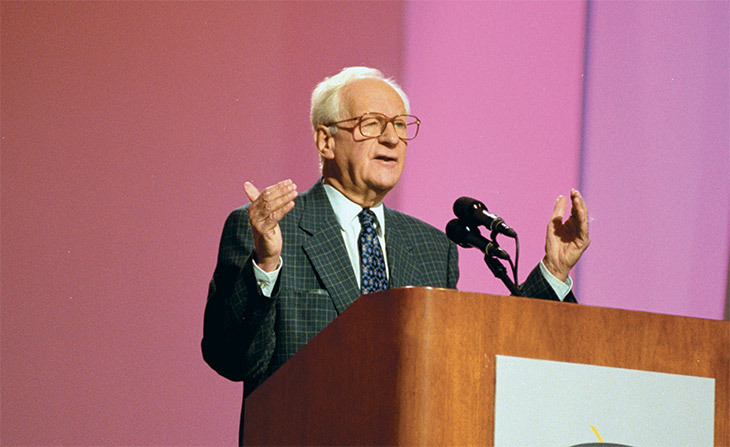 John Stott served for many years as rector of All Souls Church in London and participated with Billy Graham in such events as the Lausanne Congress on World Evangelization and Mr. Graham’s Amsterdam Conferences on evangelism. He has written many books, and he says that at age 88, with the completion of “The Radical Disciple,” he now lays down his pen for the last time. *Taken by permission from “The Radical Disciple,” by John Stott, ©2010 John R.W. Stott, published by InterVarsity Press, Downers Grove, Ill. Unless otherwise noted, Scripture quotations taken from the HOLY BIBLE, TODAY’S NEW INTERNATIONAL VERSION.